Welcome to Markplex tutorial 101 in this collection of tutorials designed to help you learn TradeStation EasyLanguage programming skills. Please join our email list if you have not already done so and we will let you know when we release new tutorials or programs. Tutorial 101 programs applied to chart. 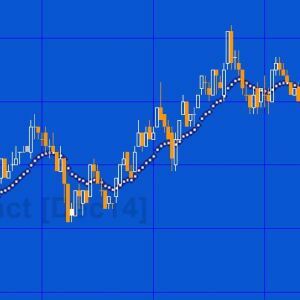 The small marks are placed at the level of the exponential moving average. It is sometimes useful to be able to draw a mark on a chart, at a specific level. For example, when creating and debugging programs you might want to be able to visualize where a value such as a stop loss or profit target is located. Before the new drawing objects became available I would often just add a text symbol (e.g. “*”) or a latter (e.g. “x”) to the chart. Text has the advantage that it is easy to draw and can be drawn for a specific bar, as opposed to a trendline which must be drawn between two bars (at least to be visible). It has the disadvantage that it is not necessarily positioned at the exact price level (for example, a quotation mark is at a higher level than a comma). Tutorial 101 demonstrates how to use the ellipse drawing object to place a small mark on the chart at an exact price level. The technique is built into a function so that it can be reused in other programs. The tutorial may also be useful to you if you want to learn some basics of using the new drawing object tools. The first input is the price value, the second input is the weight (this can be 0, 1, 2, 3, or 4) and the last two inputs are the inner and outer colors of the ellipse. Note that the colors are expressed as text in double quotes. A list of possible colors in included lower down this page.